Everyone looked longingly at the painted carriage of the train parked at Platform 2 of Heuston Station. It was festooned with happy characters from the kiddie's movie 'Hotel Transylvania 2' and the tagline 'More Monsters, More Problems'. But mystifyingly, the spin-doctor fun police refused to use it as a backdrop for the press launch by the Taoiseach and Tánaiste of the National Lucky Bag, aka the capital investment plan. Meanies. Nobody would've mentioned bloodsucking princelings or severely bitten parties rising from the dead, honest. Or, to be strictly accurate, there was a pair of press launches for the plan; the opener with Joan and Enda was to take place at the first-class podium, followed by a second one featuring ministers Paschal Donohoe and Brendan Howlin further down the platform at the economy-class podium. Though they did all arrive together, cheerfully parading down the platform with a cardboard cut-out proclaiming '45,000 Jobs'. Inevitably our tardy Taoiseach was running behind schedule, with the Government Gravy Train pulling into the station at 1.41pm, 11 minutes late. And oh how the Gravy Train was groaning with goodies to the tune of €27bn. Money for planes (Metro North airport link) trains (DART extensions) and automobiles (roads and bypasses). For maternity hospitals. For flood defences. For school refurbishments. For bus corridors and broadband. Or perhaps it was broadband for bus corridors, such was the excitement. Though alas for Enda and Joan and Paschal and Brendan, there was no Big Reveal left by the time they chugged into view. Most of the details had somehow fast-tracked their way into the media beforehand. With an election looming, both Fine Gael and Labour (especially Labour) are eager to claim credit as the chief engineer of the Government Gravy Train. And it quickly became a platform (both ends of which were bristling with gardaí and devoid of commuters) for both the Taoiseach and Tánaiste to toot their own party horns. And before the speeches even got under way, lo and behold who steamed into view but Michael Ring, hovering aimlessly behind the quartet like an uncoupled goods wagon. Enda was a little cautious, though, declaring the plan to be "affordable" and "realistic" while warning, "we can't afford everything we'd like". But Joan's speech was as exotic and wandering as the Orient Express. She managed to shoehorn in mentions of the Phoenix Park tunnel, Blanchardstown, maternity hospitals, schools, the 1916 commemoration, buses and roads. She namechecked the Hamilton-Broombridge line - "named after out most famous mathematician, William Rowan Hamilton", she chattily explained. 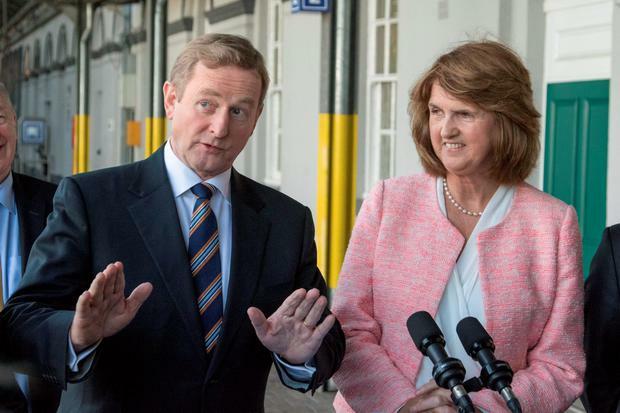 Beside her, Enda silently huffed like a mute Thomas the Tank. Now it looked like Joan was behind the steering-wheel of the Gravy Train. Behind them, Ringer visibly yearned to mention Mayo, but had no chance. But then the questions started. Was this not just the Joan and Enda Express, loaded with pre-election swag to hand out to every townland and parish? "Well, the election's a matter for the people," Enda recited automatically. "People will make their own choice in due course." He protested he had said 'no' to lots of people. "I can give a political thesaurus from Malin Head to Wexford of things that could have been included," he said. The media would not be derailed. After all, Newstalk's Ivan Yates had raised blood pressure all around Leinster House yesterday morning by declaring a birdie had assured him the election would be on November 20. So he was asked about the prediction. "He'd be wrong," said the Taoiseach. Afterwards he said he would put on a €50 bet for charity that this won't be the date. "You can tell Ivan that I challenge him," Enda declared. Hmm, so we know for sure it won't be November 20. Enda wouldn't give Ivan the satisfaction. But as the Gravy Train unloads its goodies, it still feels like full speed ahead for an early election.